The quintessential benefits of SILKtàge Rejuvenating Styling Serum lie in its signature ingredients; Camellia Oil (also known as Green Tea Oil) and Monoi Oil, an infusion of Tahitian gardenia flowers soaked in coconut oil. 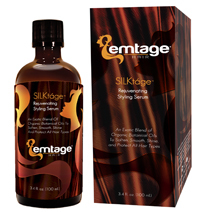 SILKtàge nourishes every hair type, especially dry, stressed, frizzy hair because it strengthens hair from the root and restores moisture lost from styling heat, chemicals, and the environment. This proprietary Organic Camellia, Monoi Oil-infused blend, along with the delicate essence of Organic Geranium, Organic Rosemary and Wild Harvested Palmarosa essential oils is rich in the vitamins, antioxidants and essential fatty acids that healthy hair needs to shine naturally. HOW TO USE: For daily conditioning and rejuvenating effects, use before and/or styling. Tap a few drops into palm and smooth into wet or dry hair. Concentrate damaged and rough ends. For extra conditioning, apply to length of hair and scalp before shampooing and leave on for 30-60 minutes. Overnight is better. Follow by shampoo and conditioner. SILKtáge Rejuvenating Styling Serum retails for $39 (3.4 fl. oz.) at www.EmtageHair.com. *The introductory price of $33 is available through April 2011.